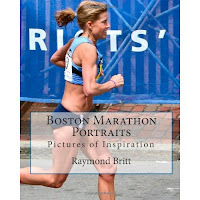 By Raymond Britt -- We've run Boston 13 consecutive times and, we can assure you: there is nothing like it in the world. You'll know what I mean when you get there. (read about the complete 26.2 mile racing experience, after all the links below). The excitement of race day begins with a dawn's early light procession of thousands of runners heading toward buses that will transport them to the race start. I prefer to get on one of the earlier buses to get settled in Hopkinton, but there's no real advantage to an early or a late boarding time. With two staging areas at Hopkinton High School for runners to relax before the race, there's plenty of space for everyone. The bus ride from downtown Boston to Hopkinton always seems long, long enough to make you realize that 26 miles is quite a distance to run. As if you didn't know that already. But it is a little intimidating, still. There can also be a small delay between the time your bus enters Hopkinton and arrives at the high school, as it takes time to empty each bus in order. I only mention this because it happens every year: a long bumpy bus ride with dozens of runners constantly hydrating inevitably leads to one or more who beg the bus driver to make an unscheduled stop for emergency bladder relief. Lesson: everyone, as we tell our kids before long trips -- go before you leave. Once in the Athlete Village, find a spot, and relax. People bring all sorts of things, from blow-up chairs, to blankets, to plastic bags to newspapers. Bring what you like, just expect it to be disposable. If it's a rainy morning, you may want to wear an old pair of shoes in the potentially muddy village, and change to your dry race shoes later. It can be chilly in the early morning, and my preference is to wear fleece to stay warm. In the past, a noon start meant the rising sun would warm the area late in the morning. With a 10am start, and runners moving to the start area soon after 9am, it's probably a good idea to wear a plastic cover or old clothes to stay warm until the start. Standing on Main Street in your race corral just minutes before the starting gun, take it all in: helicopters whirring above, TV cameras panning the runners, spectators lined up deep along the narrow roadway, the singing of the Star-Spangled Banner complete with an Air Force flyover, and of course, the natural buzz of excitement from all the runners around you. Prepare to experience the greatest marathon there is. Hopkinton. Unless you are right behind the elite runners, do not expect to begin running swiftly immediately after the starting gun. Main Street is very narrow, and there's little room to move. You will likely walk across the start line before you start shuffling, then slowly running on a steep descent. The good news is that you can't run too fast on the downhill because you are so close to other runners, so you won't beat your legs early on. Instead, enjoy what I think is one of the most amazing images in marathons: looking downhill to see thousands of heads bobbing up and down Main Street for as far as you can see. Let yourself settle into a groove through the first 5k of net downhill road. Not that you won't experience some small rolling hills; you will. That's actually a good thing. It lets your legs stretch out and work a variety of muscles. Ashland. You will briefly pass through Ashland for a couple of miles. 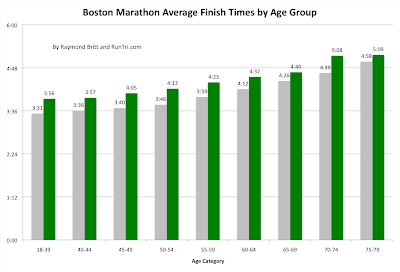 Mile 3 is nearly all slightly downhill; just make sure not to overdo it in your early race excitement. You'll pay later if you run too fast here. Mile 4 actually takes you slightly uphill, and it's a good chance to even out your running pace. It's at this point that I usually lock in to a pace/mile that sticks for the next several miles. Framingham. The main landmark in Framingham is the train station and large crowds greeting runners at about the 10k point. Miles 5 and 6 approaching this destination have continued to roll gently downhill with some brief inclines. but by now you're under control. Enjoy the crowd in Framingham -- wave, high five and smile. You won't see many people for three more miles. Natick. Some peace on the road at this point is not a bad thing. After all the excitement from early morning through the first few miles, now it's time to do what you do best: run. The course is calm, gently rolling, but not difficult. Near the 15k mark, you will pass the Natick landmark: the clock tower and Natick Town Common. Crowds will be waiting, waving you on your way to Wellesley. Wellesley. After Natick, the next two miles are again largely without spectators. Again, time to stay in control and appreciate your surroundings. Because when you get to Mile 12, the real race really starts. There is nothing like the Screaming Women of Wellesley College. Sure, you've read about them, but you have to be there to experience it. The screaming is so overpowering, in a fun way, that I steered clear left away from all the fuss in my first few Bostons. But in recent years, I've decided to join the fun, running close to the crowd, taking it all in. You should too. Because after that, it's all uphill. Sort of. Shortly after Wellesley College, you will reach the 13.1 mile point in downtown Wellesley. It will be gut-check time: how do you feel? Did you hold enough in reserve to handle the hills that will soon greet you? You will have miles 14 and 15 that roll ever so gently and slightly uphill through tree-lined neighborhoods to sort that all out. Then it's one steep roller coaster ride downhill approaching mile 16, and then it all begins. Newton. 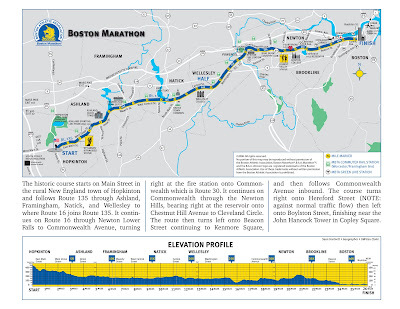 The famous hills of the Boston Marathon really begin just before the 16 mile mark. There's a solid incline as the road approaches and crosses the 93/128 freeway. The spectators will begin narrowing to see runners, until there's a small gap to run through as you cross the bridge. They will be telling you 'you look great!' and you will begin wondering if you can handle the rest of the hills. Be confident: sure you can. Because, surprisingly, the next hill doesn't come at you for another mile and a half. Not bad at all, really. You just keep running under control, and when you see the crowds getting thicker, prepare for a solid right hand turn at the Newton Fire Station to begin a steady climb. The crowds will cheer, you will smile as you put your head down and chug up this hill. It's about 3/8 of a mile long, not too terrible. I just run at the side of the road, keeping my eyes on the white stripe on the road, not looking for the top. When I get there, I get there. And when you reach the top of that hill, again a surprise awaits. It's more than a mile to the next hill, and most of that is downhill, to boot. In fact, by this time, you will begin wondering what all this talk about the Hills of Boston was all about. Your main challenge at this point will be similar to your other marathons: handling getting through mile 19 with enough left in your tank to finish. 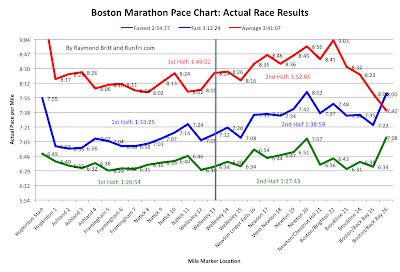 The third Newton Hill arrives at about mile 19.25, and is a little deceptive. Not particularly steep, it just keeps going longer than you expect. At 19.5, you will think you've crested the climb, but it's a brief respite. There's more to go. Stay with it. And soon, you're at mile 20. 10k to go, the fun part. The real challenge awaits: the final Newton Hill, your path to mile 21. You will hear the climb before you actually get there. The roar of the crowd, combined with a pounding of drums, tells you that It's Almost Here. You will see the gentle turn ahead, you will veer in that direction, then you will see an incline that simply disappears into the trees above. You will not see the top. That's not a bad thing, necessarily; it's a signal to keep you head down, stay focused on the road. Again, I get to the side of the pavement, and keep my eyes on the road's white stripe, and just keep moving. Just tell yourself that in a few very short minutes it will be over, and you'll be on your way to the finish. When you get near the top, you will know it. Literally, a clearing seems to open up, and you can begin to see daylight. After a small dip, which you'll hope signal the end, there's another small incline then the hard part is over. You're on top of the backside of the course, and you'll be able to see downtown Boston in the distance, just before you fly (or not) downhill towards Boston College. Brookline. Miles 22, 23 and 24 on their way though Brookline towards Boston are each net downhill, but that doesn't mean the course won't toss you a slight curveball here and there in the form of gentle inclines that frustrate the mind and body ever so irritatingly. As my body is wearing down in those final miles, I start thinking that the finish line can't come soon enough. And these little jabs by the course inclines seem much more potent than they should be. Boston. But by mile 25, all is forgiven, and you can begin to feel the finish line. The course flattens out once you cross the bridge by Fenway Park and the Citgo sign, and you know it's over soon. Take the last mile to savor where you are -- on hallowed ground, following the footsteps of 111 years of marathoners. The most special part of the course, for me, is the right turn onto Hereford Street, followed by the left turn shortly afterwards onto Boylston, with the finish banner in the distance. There's a calm before the elation on quiet Hereford Street, shaded from the sun, isolated from the intense spectator cheers that await just seconds away. The turn onto Boylston Street puts you in full view of what I believe is the greatest final stretch that you can experience in a marathon. Nearly a half mile of smiles waves and cheers from spectators on both sides of the street. The finish banner, an unparalleled sight, comes into view. Take a deep breath, appreciate every stride that takes you closer to the Boston Marathon Finish banner. You worked hard to get to this point. You're there. Enjoy it. marathon, 26.2 miles. But not just any marathon. The legendary Boston Marathon. Then it's your moment. See the time, cross the line, smile for the cameras. Congratulate yourself, be proud. You've done it. Go ahead, admit it to yourself: you Really Rock. You're a Boston Finisher. Yes, you are. You've done something extraordinary, celebrate it. Celebrate your independence, celebrate your spirit and attitude that earned that trip to Hopkinton and drove you the next 26.2 miles to the most coveted finisher's medal in long-distance running. In the Long Run, life is a collection of Moments That Matter. The ones you will remember for the rest of your life. 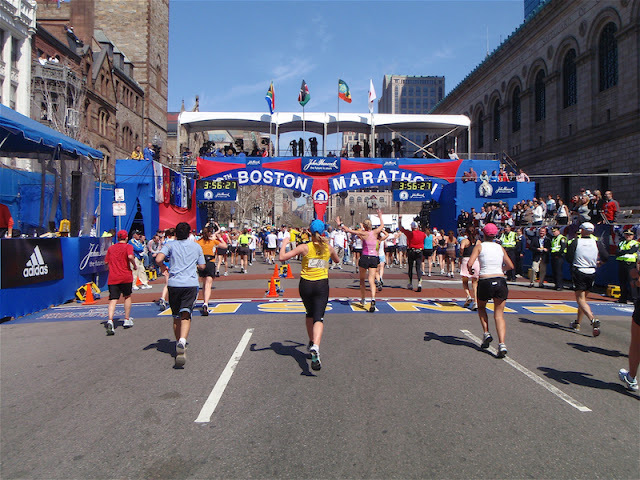 In April, your moment is in Boston, on Boylston Street, under the Finish Banner. That moment is yours. Celebrate it. From that moment on, you are a little more special. You are Boston finisher. Congratulations. Welcome to the Club. 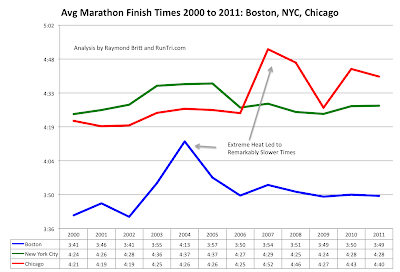 Boston Marathon 2014 Registration Analysis and Timeline. 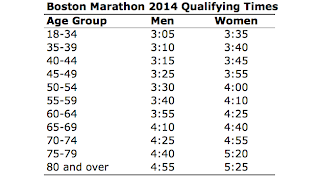 Cutoff Impact on BQ - 5 Finishers at Chicago Marathon 2012.